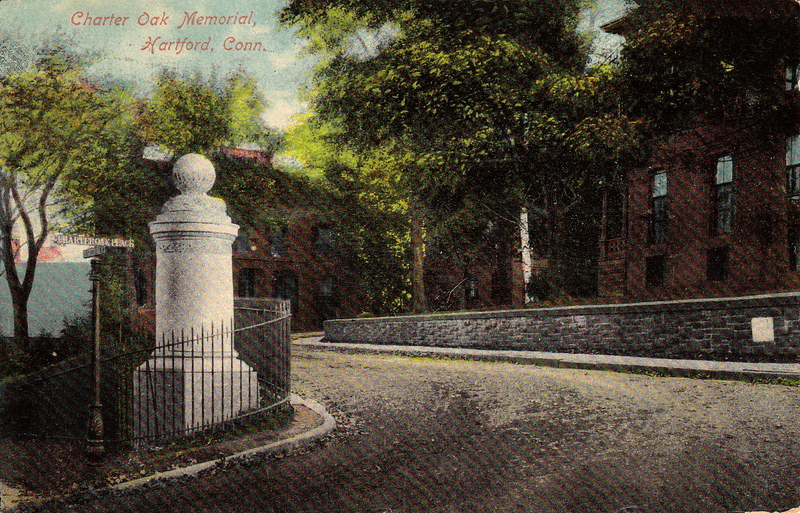 A 1905 monument marks the former location of Hartford’s legendary Charter Oak tree. 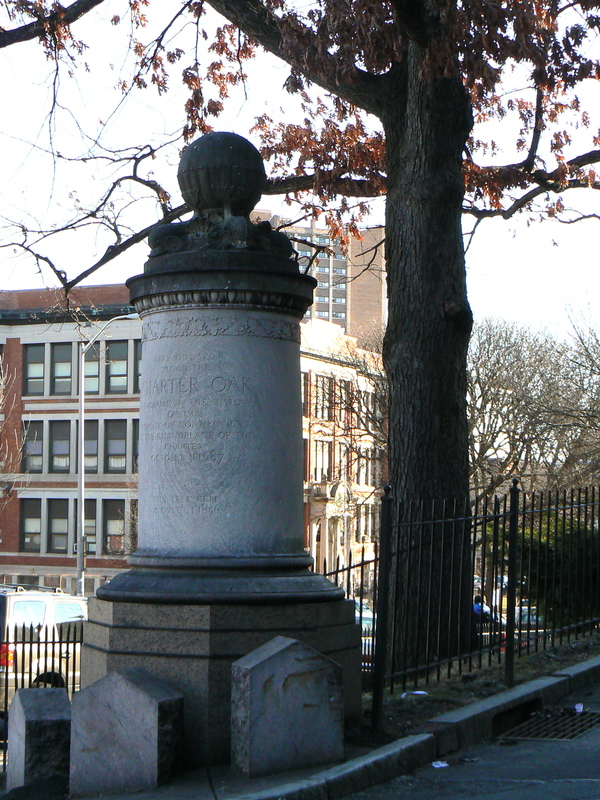 The Charter Oak, a noted landmark and symbol for Hartford and Connecticut, was supposedly the hiding place of the royal charter granting legitimacy to the colony of Connecticut. 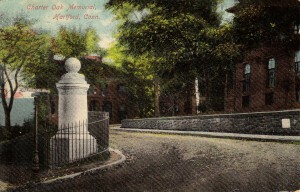 The monument, not far from where the Charter Oak stood, is at the corner of today’s Charter Oak Avenue and Charter Oak Place. 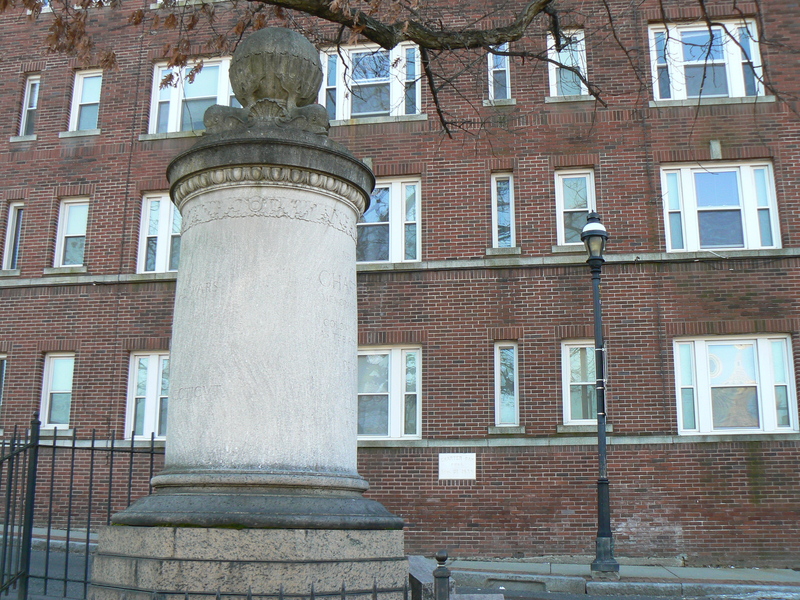 The monument is a round column topped with a globe that is supported by a base with four whales and sea shells, which we assume represent Connecticut’s maritime history. The east face of the monument is inscribed with its 1905 dedication date and credits the Society of Colonial Wars in the State of Connecticut 1633-1775 for erecting the monument. The Charter Oak legend is based on a 1687 incident that followed a political dispute over whether the fledgling Connecticut colony would be consolidated into a unified colony covering the New England states. During negotiations over the dispute, Connecticut’s royal charter was removed from the meeting room and, according to the legend, was hidden in large white oak tree that would become known as the Charter Oak. 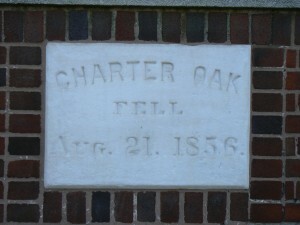 The Charter Oak tree, which grew to have a base with a diameter circumference of 33 feet, fell after a storm in 1856. 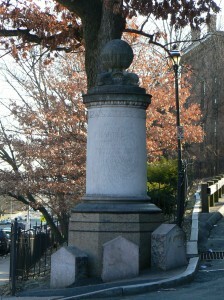 Wood from the tree was used to make the elaborate seat used by the president of the state senate and a large number of other objects displayed in the capitol building. 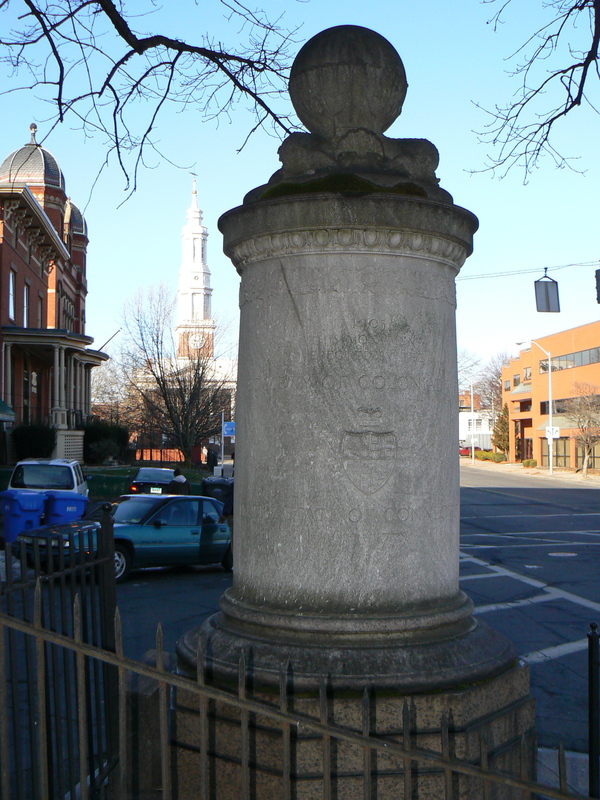 The Charter Oak, which remains a common Connecticut symbol, was depicted on the back of the state’s quarter in 2000. 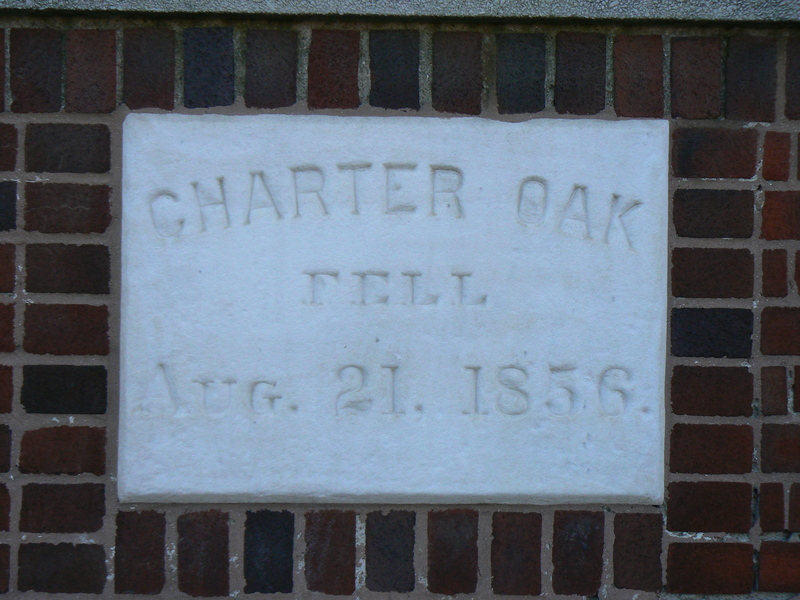 The last photo for the charter oak or the photo at the bottom of the page (looks like a postcard) was a sight for sore eyes. 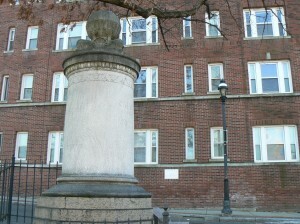 I just wish y’all woulda left the wrought iron fence and the cement post streetlight. Hats Off to whoever came up with that postcard. I think you mean circumference, not diameter. That would make the diameter (the width of the trunk) about ten feet. 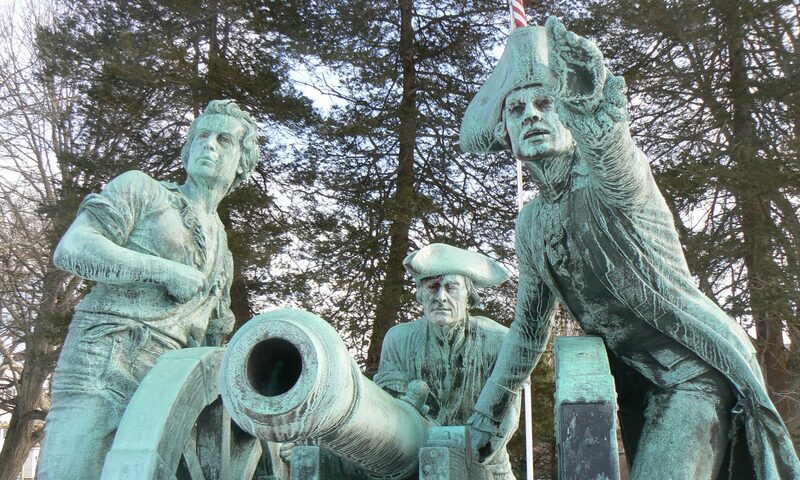 This would still make it larger than the largest White Oaks ever seen, and explain its fame among the first settlers and Native Americans alike. Thanks for the correction. Geometry (that’s geometry, right?) never was our strong suit. Neither was algebra, for that matter.